FranFrog offers FREE non-obligation consultations! We want to help you find the most promising franchise opportunity that is within your investment budget and within your line of interest or specialization. FranFrog was founded to help individuals find steady income through business ownership. The job market has changed and the only for sure thing is YOU. People are disenchanted with corporate jobs or are too young to retire. Franchising provides a “recipe” for success. If you’re ready to control your destiny, experience tax savings, a raise, and a full sense of worth and appreciation, look into franchising. Franchise ownership is a stable career path and has a 90%+ success rate. Most people can’t even predict that they can keep their jobs with 90% certainty! The network we are affiliated with provides access to a portfolio of pre-screened franchise companies with more than $3 billion in annual revenues. These franchise companies include home based, on-site services and brick & mortar retail businesses. As a Franchise Consulting Agency, FranFrog will review your skills and match you with companies that give you the opportunity to make money and enjoy your success. We work all across the United States helping ambitious entrepreneurial minded people achieve their goals by giving them access to great, profitable companies. As your coach we will provide expert advice and help you search for viable business opportunities in the franchise industry. FranFrog will be able to explain and measure risk factors associated with the purchase of a new or existing franchise business. 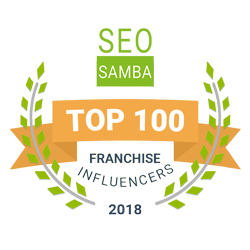 Focused on identifying the right fit between franchise companies and individuals looking into business ownership as a career alternative, FranFrog uniquely bridge the gap between the franchisor and the franchisee candidate. Assist in determining if franchise ownership is a viable career alternative. Find out if Franchising is right for you! Send a request to receive your FREE report from FranFrog. We would like to schedule a Free Introduction call, to learn more about your needs, wants and expectations are in owning a franchise. FranFrog hosts Free live Franchise Expos in a city near you. We also schedule live webinars with premium Franchisors. Get Your Free 2 Hour Consultation Today!